My model mentioned to me a while ago that it was difficult to find decent Steampunk attire in Second Life these days. I have to admit I was surprised to hear this, since Second Life has always had a large contingent of Steamfolk, Victorians, and various odd dieselpunk people. You would think with all that wandering blithely around the grid, that it would be a simple affair to hit the shops for a bit of a Steampunk lark to add to your already bulging, straining at the seams inventories. Honestly, who am I to argue these points with someone who clearly shops way more than I do. So, leaving it to the experts, I set forth on a quest to create a Steampunk gown that LO! contains no gears. Sorry about that. But slapping gears on something and calling it “Steampunk” is rather like dying your flannel shirt black and calling it “Goth”. While that practice is, in theory, correct, it’s pretty cliche. He said, surreptitiously nudging that gear covered waistcoat under the Axminster. After hammering out a basic design, and giving it the metallic sheen it so richly deserves, the Malefica was born. 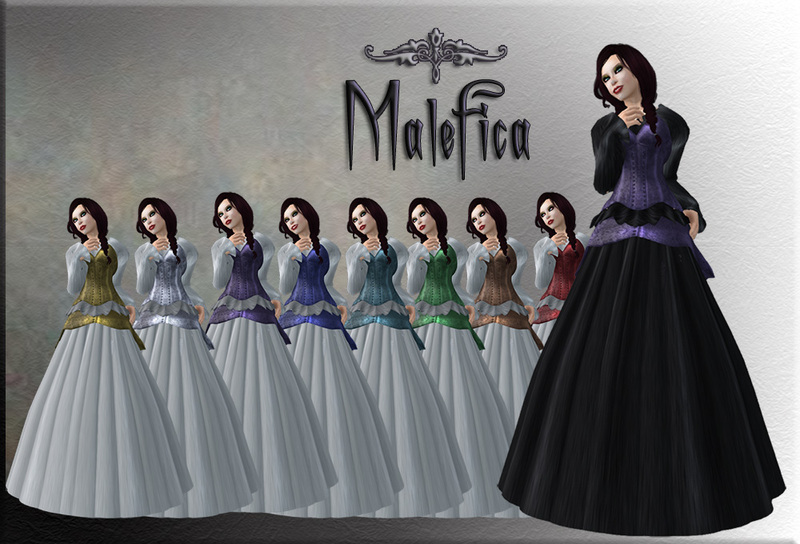 Malefica means “witch” in Latin. Not that this is strictly a witch costume, or that I’m disparaging my model, or anything, but it evolved from something kind of Steamy to something kind of Steamy and Gothic and Witchy all at once. It’s elegant in its simplicity.